26 years, 4 months, 3 days old age. Quinton de Kock will turn 27 on 17 December, 2019. Only 7 months, 26 days, 22 hours, 13 minutes has left for his next birthday. Quinton de Kock has celebrated the total number of 26 birthdays till date. See the analysis by days count and bar graph. 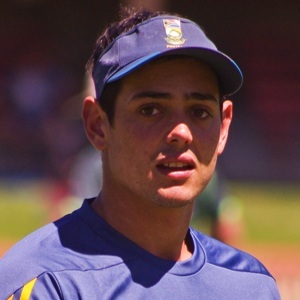 Quinton de Kock was born on 17-12-1992 in Johannesburg, Gauteng, South Africa. He is a South African Cricket Player. He was selected for South Africa's T20I series against New Zealand in 2012-13 to keep wickets in place of AB de Villiers, who asked to be rested. But he did not make much of a first impression on the international stage. After a lean series in Sri Lanka in July 2013, he was dropped. De Kock returned in November that year and scored his first ODI century against Pakistan. A month later, he reeled off three in a row against India. Early in 2014, de Kock made his Test debut after Alviro Petersen took ill, but was only given a permanent place later that year, on a tour to Sri Lanka. De Kock has also played in the IPL for the Hyderabad team in the 2013 edition. From 2015 onwards, he has played for Delhi Daredevils and was roped in by RCB in 2018 and will play for MI in 2019. He was spotted as a schoolboy talent and started playing for the affiliate club Old Eds. This is where his journey as a cricketer began. De Kock shares the record for the most number of ODI centuries by the age of 21 with Sri Lankan opener Upul Tharanga. Both men scored six ODI tons. In his earlier days, he was chubby so his Highveld Lions teammate Neil McKenzie gave him a nickname Tubby Taylor. He didn't like that name and worked hard on his fitness to reduce weight. In just a lil over 2 months, he lost considerable weight and is now called Quinny by his teammates. His girlfriend Sasha Hurley was a cheerleader.